This work has a two-fold personal significance for me in that it is dedicated to Christopher Rowland, Director of Chamber Music at the RNCM, a dear friend and colleague for many years and someone who has established the chamber music programme at the College as one of the finest in the world. Additionally, the concerto was written for Li-Wei, who was an undergraduate student at the RNCM when I came into post as Principal in 1996, and who has since established a highly successful international performing career. The concerto is in four movements which are played without a break: Meditation, Intermezzo, Toccata-Scherzo and Song. The work lasts for some 18 minutes and is scored for two oboes, two horns, timpani (doubling tubular bells) and strings. It is organised in one large arch-shaped structure, with two fast inner movements flanked by two outer slow ones. The solo cello opens the work reflectively, and introduces core melodic material which is continuously developed throughout the concerto. Gradually the strings enter, then wind and timpani, and build a pyramid twelve-note chord, at the peak of which there is a dramatic climax. The music then subsides (solo cello again), but links to the two faster middle movements. The second movement – Intermezzo – has an ABA structure and in its middle section quotes the opening of Shostakovich’s Third String Quartet (written in the same year as Christopher Rowland was born!). Indeed, the ghost of Shostakovich looms large throughout the concerto in more ways than one. The Toccata-Scherzo is energetic and rhythmically-charged, again using an ABA structure. Here the writing for solo cello is quite virtuosic, but not, I hope, in a shallow sense. The music builds inexorably towards a powerful climax, underpinned by the opening twelve note chord’s re-appearance, together with a violent outburst from the timpani, at which point a tonal resolution (on G) arrives through a pianissimo held chord on strings which leads directly to the final movement – Song. And so the music arrives at its emotional heart through a simple melody (present in other forms throughout the work) announced by solo cello at the very top of its register, against a quiet backdrop of horns and strings. A solo oboe enters, with cello in canonic reply, and all the time the music builds in texture and intensity, now with tubular bells joining in the joyful and optimistic conclusion. Best of all is A Song for Chris, an ear-tingling cello concerto of ingenuity, beauty and substance. … is a beautifully balanced work, and is quietly impressive. It is a very fine work, exploring cello technique … and at the end deeply felt and exceptionally powerful. [Presteigne Festival] Composer-in-residence Edward Gregson was represented in the programme by his gripping and ultimately cathartic concerto for cello and chamber orchestra entitled ‘A Song for Chris’ (2007). Soloist Gemma Rosefield’s wonderfully layered and variegated account embraced the score’s many-sided approach to grief and loss, from violent outbursts to hushed acceptance. Edward Gregson’s gripping and ultimately cathartic concerto for cello and chamber orchestra entitled ‘A Song for Chris’ (2007) was graced by wonderfully layered and variegated playing from soloist Gemma Rosefield. She captured the arch-shaped score’s many-sided approach to grief and loss from violent outbursts to hushed remembrance and finally poignant acceptance. 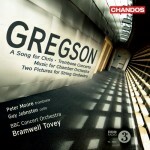 Vass and the PFO revelled in Gregson’s unflaggingly inventive instrumentation which created the illusion of a much bigger ensemble than its chamber-sized forces.